Advancing Together invites different Database Development Companies or individual’s person who are specialized in this field to submit the Tender. Advancing Together is seeking an energetic, professional individual with strong Information and Communication Technology (ICT) skills to join our team in Pristina. If you are highly motivated, detail oriented, a quick learner and enjoy working with people, then we encourage you to apply. Vacancy Deadline for application is 10th of February 2019, 24:00 hours. 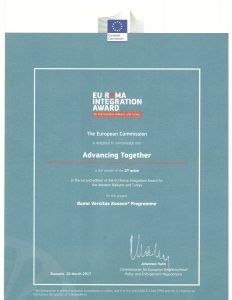 Advancing Together strongly encourage interested people (potential experts and facilitators) to refer to the bellow call of CoE and to apply. Advancing Together co-signs a letter condemning antigypsyism in Italy and asks Italian government to uphold the rule of law. For more details click the text below. 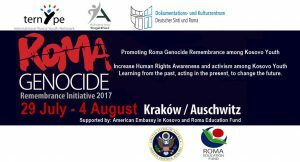 ROMA GENOCIDE REMEMBRANCE INITIATIVE 29 July – 4 August, Krakow/Auschwitz 2017. Promoting Roma Genocide Remembrance among Kosovo Youth, Increase Human Rights Awareness and activism among Kosovo Youth Learning from the past, acting in the present, to change the future. Supported by: Roma Education Fund and American Embassy in Kosovo. Aplikim për Kampin Verorë për studentët e programit RV Kosova 2017. Advancing Together invites all Rent Car companies to submit their offers. For more details click the text bellow. Prishtina, 01 June 2017: On Friday 26th May, the United Nations Secretary General expressed his “profound regret” that hundreds of Roma, Ashkali and Egyptians were poisoned by lead in camps run by the UN Mission in Kosovo (UNMIK). The European Roma Rights Centre (ERRC), Advancing Together, Durmish Aslano, Iniciative 6, Nevo Koncepti, Romtegra, RROGRAEK and Voice of Roma Ashkali and Egyptians, condemn this lack of commitment from the UN to provide compensation, medical treatment and recognition to the victims of lead poisoning at the hands of UNMIK. On 15th May, after almost a year of advocacy campaigning with the UN, the ERRC submitted over 10,000 signatures in a petition to the UN Secretary General, demanding a full apology and compensation for the abuses carried out by UNMIK. The ERRC is profoundly grateful to the signatories of the petition. Your signatures brought the plight of the victims to the attention of the UN and the world. We are committed to continuing our pursuit of justice in this matter: the United Nations must be held to account for their actions. The campaign began last year, after the UN Human Rights Panel said UNMIK’s actions were “tainted by racial prejudice”. The panel condemned UNMIK for violating a litany of human rights obligations. The Special Representative of the Secretary-General (SRSG) was criticised for not cooperating with the process, including actively withholding key documents. They found that the SRSG’s office relied on their own discriminatory stereotypes by accusing the Roma of being responsible for their health problems because of their “lifestyle,” a racist insult was used to explain away the lead poisoning and the UN’s responsibility for the violation of the victims’ rights. In response to the panel’s findings and the pressure from civil society, the UN’s issued a statement of “profound regret” but no apology. No apology for the deaths and suffering caused by lead poisoning; no apology for the racist neglect by UNMIK of vulnerable children, women and men. As for compensation, there will be no individual compensation for the families of victims. There will be no coverage for medical treatment for those whose health was damaged. These Roma, Ashkali and Egyptians were placed in the camps after the Kosovo War ended in 1999. Their homes had been destroyed by extremists who burned their entire neighbourhood down. UNMIK moved them into the camps despite knowing the area was dangerously polluted. French soldiers with incredibly high levels of lead in their blood were evacuated from the area, but the Roma, Ashkali and Egyptians– including children and pregnant women – were allowed to remain. It was meant to be a temporary measure, but the people were stuck there for nearly a decade. The Secretary General has announced the establishment of a Trust Fund to implement community-based assistance projects, primarily in North Mitrovica, South Mitrovica and Leposavić. The UN claim this fund (which has been established without initial funding) will broadly benefit Roma, Ashkali and Egyptian communities. The assistance projects will not focus specifically on addressing the pressing needs of those suffering from lead poisoning, but on the broader needs of the communities in these areas, including with respect to health services, economic development and infrastructure. Whilst we welcome the UN response to the pressure from civil society and the thousands of people who petitioned for justice, this Trust Fund does not make up for the injustices done, nor does it do much to alleviate the immediate problems of the people who suffered in the Mitrovica Leposavic IDP camps. The UN’s response to the panel’s findings is underwhelming and long overdue. The lack of recognition by way of a public apology is an insult to the people who have long suffered in the lead poisoned camps awaiting justice for the crimes committed by UNMIK. We, the undersigned organisations reiterate our call for the UN to implement the recommendations of the UN Human Rights Advisory Panel, including making a full apology, providing compensation to the 138 individuals represented before the panel, and giving urgent medical treatment to those affected by long-term lead poisoning.